The underside as originally placed is enriched with the start of an acanthus scroll or bolster, a course of cut-out waterleaf running about a large six petal rosette in a fillet; all this is inset within a flat, plain surface on the unbroken edges. The employment of a large, flat six-point rosette in this enrichment context is unusual, especially because the smooth surface into which the circles are half-set leaves no indication as to what the fragment bears on. Normally, rosettes of this sort are set in the middle of the soffit, equidistant between two columns which they echo in their round (shape) outlines. Severan rather than Flavian work, probably from a building of unusual shape, perhaps a temple front in antis. If we accept this fragment as forming the soffit enrichment joining the abacus of the capital then we must imagine the rosette as having formed a half circle echoing the cushion and capital beside it. It has been suggested that the rosette has been recut in post-antique times to make a full circle and therefore a more interesting fragment, but more likely the panel was carved out more fully so that adjustment in fitting on the capital would not leave an unsightly gap. An idea of the relative setting of the fragment may be gathered from comparison with a recently re-excavated "frammento di epistilio dal Campidoglio", which, according to Giglioli, was probably supported on the columns of a small edifice near the Flavian temples of Jupiter Capitolinus1. The underside of the architrave of the Temple of Venus Venetrix in the Forum of Caesar shows the most elaborate late Flavian development of this particular part of Roman architectural enrichment. The area between the columns is carved into elaborate foliage from which springs a winged amorino(? ), and the area around the columns is enriched with shortened acanthus leaf pointing inwards2. 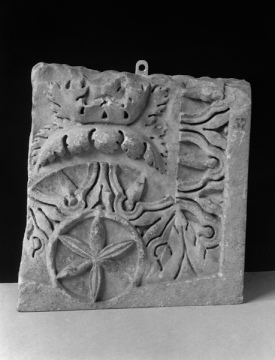 The Severan dating of this fragment is confirmed by the identical stylistic connections with the grooved, cut-out waterleaf and general detail of an Ionic capital with Serapis bust protruding above the volute foliage, from the Baths of Caracalla and now used in S. Maria in Trastevere3. 1G.Q. Giglioli, Bullettino della Commissione Archeologica Comunale di Roma, LXXII (1946-8), 1951, p.164 ff., fig. 4. 2 P. Ducati, Arte in Roma dalle origine al sec VIII, Bologna, 1938 pl. CXVII, 2; also P.H. von Blanckenhagen, Flavische Architektur und ihre Dekoration untersucht am Nervaforum, Berlin, 1940, pl. 13, no. 39. 3 German Institute in Rome, photographic neg. 7586.